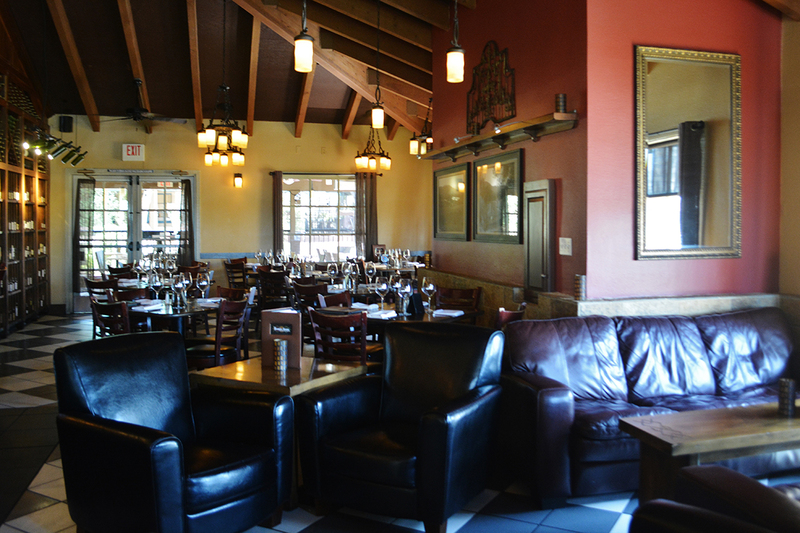 Walking into Rancho Bernardo’s Barrel Room always feels like we’re walking into Central Perk, the warmly inviting coffee shop featured in so many episodes of the long-running sitcom Friends. 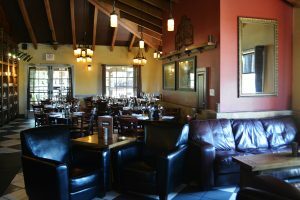 The Barrel Room is a neighborhood wine bar and bistro whose comfy leather sofas and chairs, ample rich-wooded bar and high-top tables greet you as you enter and encourage happy chatter and warm socialization. Wine, friends, and great food just seem to meld together in perfect harmony in this casual bistro, that’s classy, but unpretentious. And, the wine bar and restaurant is always busy, especially on weekends, with a packed house and lines sometimes out the door, attesting to its perfect blend of these ingredients. 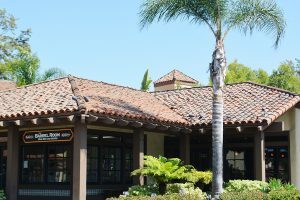 The Barrel Room will celebrate its 10th anniversary in January, 2017, and since the beginning, North County San Diegans have taken to it like ducks to water. 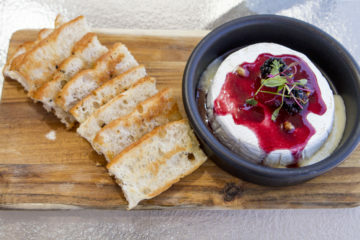 Patrons come from all over San Diego and beyond to partake in Barrel Room’s incredible wines and dine on creative menu items at this wine bar restaurant. General Manager, Brett Preston who’s been with the restaurant since it opened in 2007, aptly characterizes the Barrel Room’s offerings as “how the world of wine should be with New World attitude and Old World style.” Brett began his career with Barrel Room as a server, returned to college for his degree, and was promoted to manager in 2015. Trevor Chappell took over as Executive Chef in December, 2014. Incredibly, he and Brett have been friends since childhood when Trevor joined his sixth grade class after relocating from the east coast. Trevor pursued a vocation in the culinary arts, steadily advancing his career. Finally when the restaurant was looking for a change, Trevor became the perfect choice. Barrel Room’s owners are brothers Nate and Zachary Higson and their lifelong friend, Grant Tondro. Restaurant employees along with the owners are a tight-knit group, more like family than owners and co-workers. It’s the open collaboration and sense of pride that makes the Barrel Room so unique, and it’s evident from the moment patrons first step through the door. Per Brett, “each patron is a valued guest. 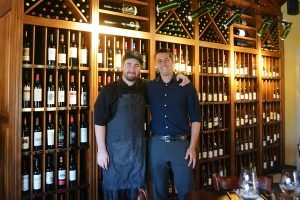 We appreciate their feedback on the food and wines, and take it very seriously.” As chef and manager, Trevor and Brett make it a point to actively interact and mingle with their guests. 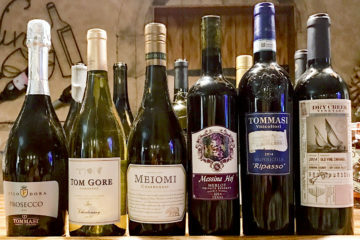 We were impressed with the immense wine selection, and the reasonable prices of top end wines such as Opus One, a wine rarely sold by the glass in other establishments. 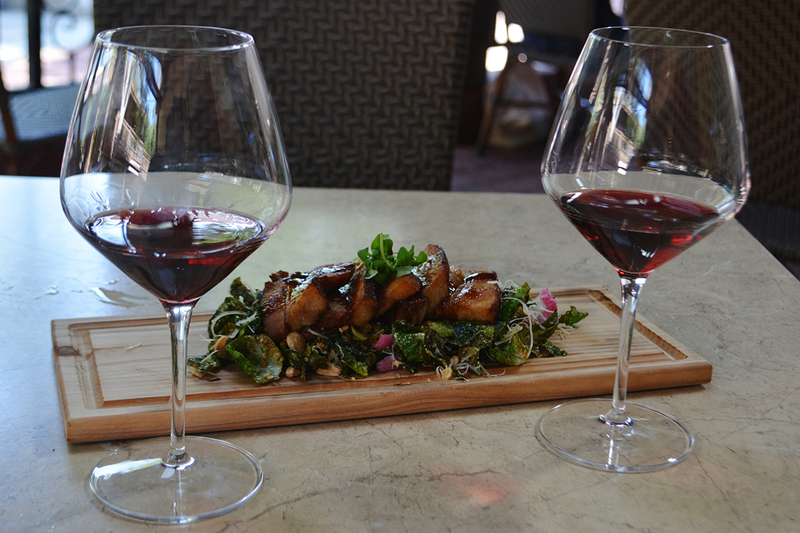 The wine menu is seven pages long, with over 300 selections, 60 of these available by the glass. 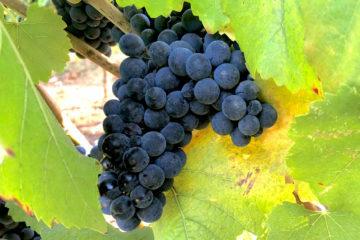 Wines come from numerous U.S. and international wine regions, representing several varietals. 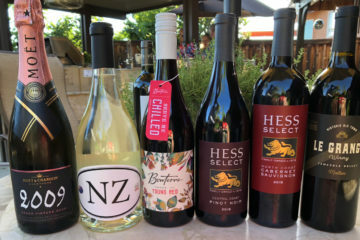 Wines are selected for their quality, using small boutique wineries as much as possible while keep the wines unique, yet affordable for customers. 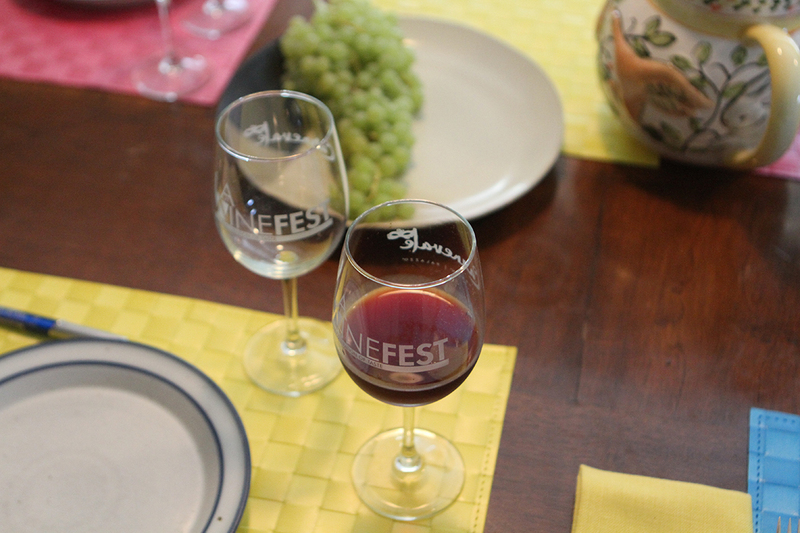 Wine flights are extremely popular, not just with newcomers, but those wanting to taste more than one wine at a time. Brett proudly showed off his wine contraption, a Coravin, created by a medical device inventor used to keep their premium wines fresh after opening. He explained how a small needle is injected into the cork to remove the wine and fill the empty space is with argon to prevent oxidation. The argon is an inert gas that has no effect on the wine. When the needle is removed, the cork seals itself once again as if the wine was never opened. Chuck Herald is the beverage director and certified sommelier, though as we’ve experienced on numerous occasions, the entire staff has impeccable credentials with impressive expertise concerning the fruit of the vine. 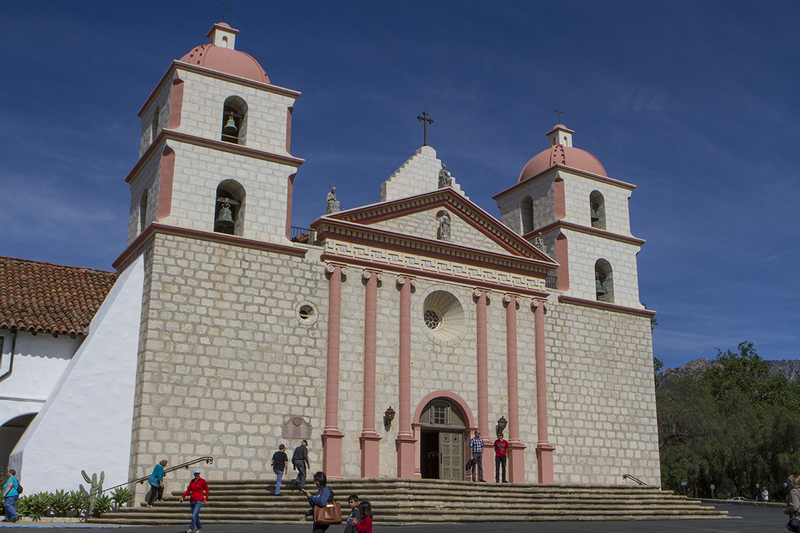 They have a distinct ability to “meet each patron where they are in their wine knowledge”. There is no wine snobbery here, and it’s refreshing. Menu items are inspired by Trevor’s travels and places he’s lived and trained, like northern Italy, Barcelona, Spain and France. His sous chef is Hispanic, giving a touch of Mexican-influence to several of the dishes. Their new menu focuses on quality and top-level consistency vs. quantity in their offerings, and has been well embraced by their patrons. Seasonality plays a key role in changing up menu creations and chef specialties, taking advantage of the freshest local products from area farms and markets. Full entrée items are still available, though more shared plates have been added to the menu as guests gravitate more to this style of dining. And, we had the pleasure of experiencing the pairing of top-notch quality wines with these delightful small plate menu items under the heading “For the Table”. Our first taste, a California Roederer Estate Brut Rose, had aromas of sweet rose and tastes of bing cherry, strawberries and brioche. The wine paired perfectly with the Ahi Tostados, a ceviche-like creation of ahi tartare with watermelon, cucumber, Fresno chili, soy lime dressing and avocado puree. Next came a wonderful California 2013 Domaine Anderson Chardonnay, sporting peach, Meyer lemon and apple flavor taste with light but classic oak nuances. Paired with a Crab Cake Soufflé, the melding of tastes was exquisite. This light and airy soufflé was a delightfully new twist on crab cake, and topped with poblano cream and thin slices of jicama and pea sprouts. Thirdly, Chef Chappell delivered the best pork dish we’ve ever had. Pork belly has become one of the foodie rages around the country, but this Smoked Pork Belly is almost indescribably delicious. Paired with a perfect 2013 Sta. Rita Hills Melville Pinot Noir, one of Barrel Room’s most popular wines, this mouth-watering meat dish is slow cooked to perfection for 24 hours Sous Vide. The pork belly, crisp and moist, with no leaking fat, was artfully served with a Palm Miso Glaze, Brussel sprouts, pickled onions, marcona almonds and parmesan. Much to our delight, Chef Chappell also added to this pairing a three-meat charcuterie-duck prosciutto, chorizo, and guanciale (an Italian cured meat), all made and cured by the restaurant. Charcuterie boards have always been a popular item here, with numerous choices of meat and cheese tailoring to individual tastes. 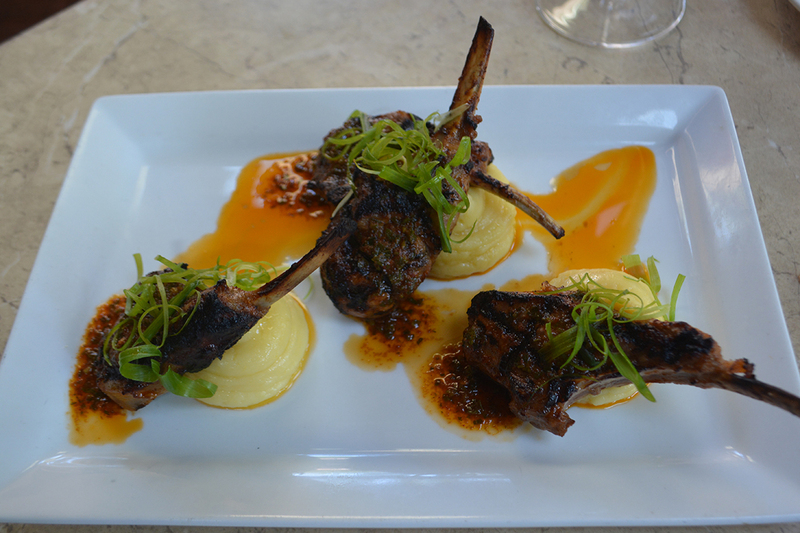 If our palates hadn’t been tantalized enough, the last pairing consisted of a 2010 Perry Moore “Stagecoach Vineyard”, Napa Valley Cabernet Sauvignon, accompanied by Mongolian Grilled Lamb Chops, imported from New Zealand. Prepared with red chimichurri sauce served over a potato puree, this wonderfully prepared and seasoned entrée was impossible to resist, despite our full stomachs. The popularity and success of this bistro has more than exceeded the expectations of its owners. One patron, a regular for ten years said it best “this place is like no other. My neighbors and friends all come here. 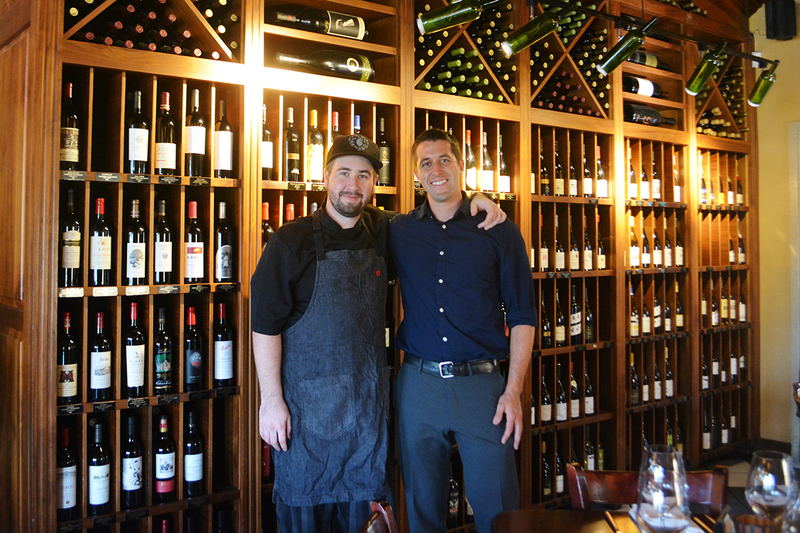 With friendly staff, great wine, and great food, they’ve got it covered”. On that, we can totally agree. And for the record, Brett Preston confirmed rumors that a second Wine Barrel bistro is slated to open in late 2016 in the Carmel Valley area. How can San Diego be so lucky?